I’ve often felt that the best indication of a country’s cuisine isn’t found in well lit restaurants or even hole in the wall cafes hidden down darkened alleys. In my eyes, a true indication of a country’s spirit and personality can be found in the rudely constructed stalls hugging already crowded sidewalks. In the wizened faces of ajoshi and ajumma (old men and women), you get a far more authentic experience than you would inside a restaurant where harried waiters hurry too and from trying to keep their customers and employers happy. While some are little more than faded canvas tents stretched over a hot plate and a not entirely hygienic collection of ingredients, others are garishly decorated with strings of fairy lights and radios blaring out the ‘throat singing’ music that is popular amongst Korea’s older inhabitants. What they lack in uniform design they make up for in a uniformness of smell and sound. The hissing of fat on grills, the scrape of spatulas, and the rapid fire Korean as orders are taken and advertisements shouted. While each stall specializes in a different type of food, street stalls often cluster together to form islands amidst a constantly churning sea of passers by. Korean street food speaks greatly towards the poverty that the peninsula’s inhabitants had to endure for so long. 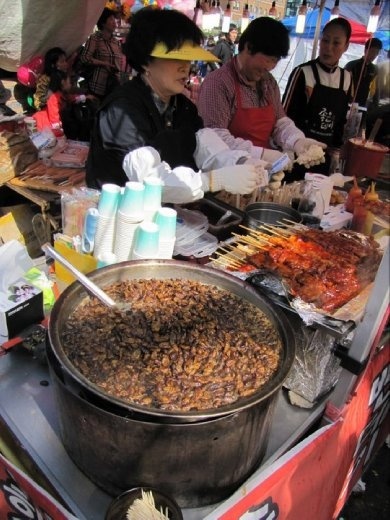 While the younger Koreans are lucky enough to live in a world of iPods, high speed internet, and on demand television – the older Koreans who typically man the street food stalls remember all too well a time when a crippled economy made dishes such as boshintong (dog soup) and bondeggi (boiled silkworm larvae) such an essential part of the daily diet. 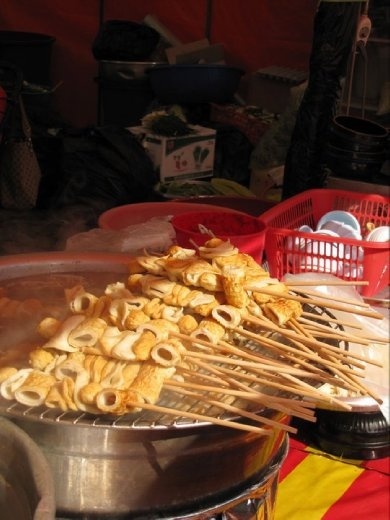 While the much maligned dog soup is no longer a common sight on Korean streets, the foul-smelling bondeggi are still a staple of Korean street food. My first brush with the dish was being assured by my Korean guide that it didn’t taste as bad as it smelled. I guess they were right, but it was a near thing. After an initially tolerable taste, the aftertaste is one that needs to be experienced to be described. In my two years in Korea, I didn’t find a single Westerner who had developed a liking for the dish. But that isn’t to say Korean street food is without its charms. Piping hot odeng (processed fish served in a cup of hot, fishy broth) is a treat on a cold winter morning, and twigim (deep fried vegetables, shrimp, egg, or noodles) offer up a savory alternative to Australian late night staples such as McDonalds or a kebab. Dipped in soy sauce and eaten after a night out, twigim is an unhealthy but thoroughly filling addition to any night on the turps. As Western culture has become a more and more common part of Korean day to day life, so too has its influence crept into street food. ‘Toasties’; grilled sandwiches of ham, cheese, and vegetables; are a popular treat for less adventurous tourists, while the descriptively named ‘chicken on a stick’ is a bit more of a risk for those brave enough to risk potential salmonella. I lived in Korea two and a half years without incident, so it can’t be that dangerous. It’s not all savory though. 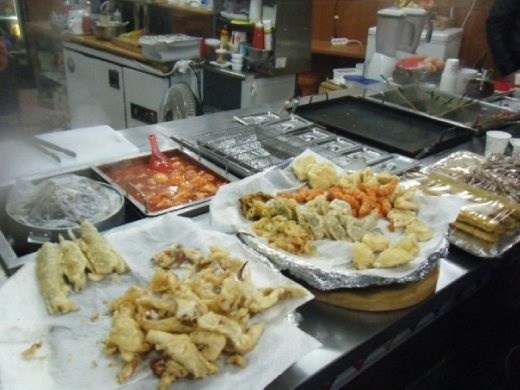 Korean street food features a number of sweeter treats to tempt on hot days or chilly nights. The health conscious might be lured in by tropical fruits (typically pineapple or watermelon) on a stick or a lightly salted bag of fresh roasted chest nuts. Pot bin su; a deliciously refreshing mix of fruits, shaved ice, sweet red bean paste, and corn flakes; is a popular dessert on hot summer days. It’s even crept onto the menus of major fast food chains after attaining popularity as a street food initially. A personal favourite of mine – pockets of dough inside which nuts and peanut butter have been liberally applied – are mirrored by the thoroughly unhappy Western influenced waffles and mock cream stalls that have sprung up in recent years. 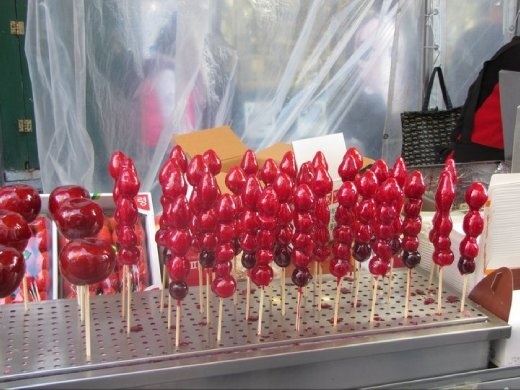 There are even toffee apples and toffee strawberries. Korean street food manages to offer up something for virtually anybody. While the country isn’t a particularly friendly one for vegetarians (and even less so for vegans) – street food manages to offer up more options than what you’d find in a restaurant or café. Roaming the streets of a Korean city – be they illuminated in the ghastly light of too many neon signs or quieter alleys off of the beaten track – is sure to unearth a few gems. Two years in Gwangju allowed me to find all manner of secret stalls that I came to call my own, and the people who run these stalls – local people who live and die by their business – are just as big a draw as the food itself. It’s a charming (and delicious) window into the heart and soul of Korean life. Chris Walker-Bush is a 28 year old theater graduate, writer, former drunken layabout, and hopeless romantic traveling the world and trying to avoid an ordinary existence. He writes about his adventures and shares travel tips at Aussie on the Road.